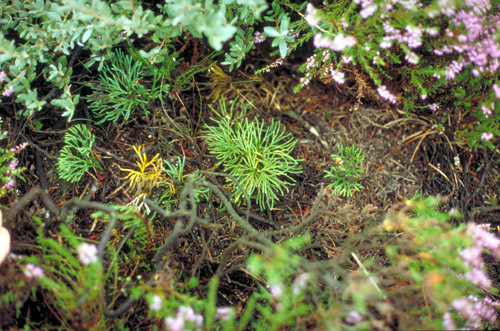 The heaths in Denmark are often developed on dry, acid and sandy soils poor in nutrients. The vegetation on the dry heaths in Western Jutland is dominated by dwarf shrubs such as Calluna vulgaris, Empetrum nigrum, Vaccinium vitis-idaea, Salix repens ssp. repens and Genista anglica mixed with herbs and grasses as Deschampsia flexuosa and Agrostis stricta. Lycopodium tristachyum (left picture) in the middle of the picture surrounded by flowering Calluna vulgaris is a rare plant on the heath. To day the species can only be found a few places in Denmark, mostly in Jutland. On the picture some of the greyish leaves of Salix repens can be seen too. 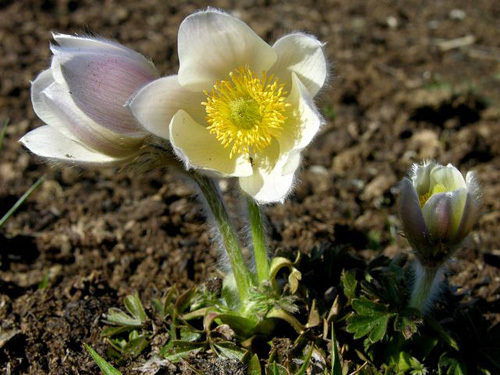 The beautiful Pulsatilla vernalis is getting very rare in Denmark and is only growing a few places in Jutland. It is totally dependent on burning and grazing of the heaths. Back to West Jutland heaths.